I recently shared an article about Gamification techniques, and one of those techniques is to use an avatar or character that follows you through an entire e-learning course. Why do this? Though it’s a good idea to choose characters that are relevant and that people “connect” with, it’s also about control: learners like to have control! In this example, notice how you get to choose either your female or male character at the start of the scenario, and the character you choose is then used throughout the scenario. A community member asked: How can this be achieved using Articulate Storyline? As usual, there’s more than one way to do something in Storyline. My example will show you how to use a single variable, along with the appropriate triggers and states, to achieve the personalized avatar. The first step is to build out the slide where the learner chooses a character. So go ahead and pop a few illustrated characters onto your first slide, as well as a Select button. Now, because you’ll want the character you selected to show up later in the course, copy one of the characters you just inserted onto a few of your content slides. Now create a new state for that character to display the male avatar. The idea is to toggle between the male or female states depending on which avatar the learner selects on the first slide. 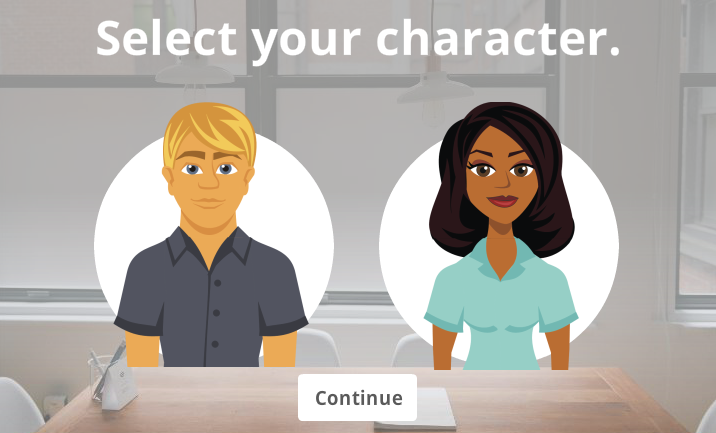 Back on the slide where learners select their character, select both of your characters to create a button set. Putting items in a button set means only one of them can be selected at any given time. Now you need to create the variable that controls which avatar is visible throughout the course. To do that, create a new number variable with a default value of 0. The next step is to add triggers to the Select button. The first trigger adjusts the number variable and makes it equal to 1 if the female avatar is selected when the Select button is clicked. To save yourself time, copy and paste the first trigger. Then you can simply update the value to 2 and the selected character to be the male avatar so that when the Select button is clicked, the variable will adjust to 1 or 2, depending on which avatar is selected. The last thing you need to do is add triggers on the content slides that display the appropriate avatar. Add a slide trigger that will show the female state on the character if the variable is equal to 1, then add a second trigger that will show the male state on the character if the variable is equal to 2. Need a closer look? Watch this video tutorial that will guide you through the process, step by step. And there you have it—a quick and easy way to easily use a single variable, states, and triggers to control a learner’s avatar in a Storyline course. PS - Just want to mention by using the number variable (rather than a true/false var) you can easily add in as many characters as you want, and just assign each new character a new number. And of course you can also do with this photographic characters just as easily as illustrated. Hi Nicole, Thanks for the great post! Can you tell me if there is a way for people to upload their own avatar and have it appear at select places in the timeline? Thanks, Tim! Love that example by you! I love this post Nicole, it's so useful! Nice work. If you add more characters, you could also use the slider bar as your selector. Yup, the sliders are definitely an awesome new feature. I actually just built this interaction so stay tuned I'll be posting a link for you shortly with a demo file and article. Thanks for the idea, Sean! Very usefull post/tutorial, thanks! I'll keep this one bookmarked. What a great idea using number variables! I also like the idea of using sliders to create a slick intro page. Like Tim, I like to include the personalisation of giving the learner the chance to enter their name. Yes, adding the name is a nice extra touch. And the number variable is nice because it lets you add as many characters as you want easily, just assign a new number to each one! Hi Malcolm, to create a button select hold the CTRL key and select all 6 characters. Then, right click the mouse to open up the menu and from the Button Set menu option click "create new button set" then give it a name, and you're good to go. A selected state will automatically be created for all 6 characters you've included in the set, and only one can be selected at a time. Hi Malcolm ,yes all objects for the button set have to be on the same layer. I will be using this on my next project! Thanks! Happy to hear that! Thanks, Claudia! I was thinking of using this technique in a business acumen scenario course I'm developing. However, I'm using states with the avatar that changes the facial expression when the learner mouse over the different choices. I know you created male and female states but I will need 3-4 additional facial expression states. Can I combine the two different state changes with this technique? Thank you so much for writing up this post and making the tutorial. I've seen courses (like Tim Slade's example) where the learner was directed to select an avatar at the beginning, but didn't think I'd have the Storyline skills for a long time to set something up like that. You made what I thought would be a complicated build really easy to do! Thanks! Hi Nicole, I tried this step by step following your video, but must be missing something as I keep landing on the male character on the second slide. Can you think what I might be missing? (I went through it twice!). Also can you share how you made the white "angelic" glow? That's really cool! Thank you! I need some help with this, I watched the video several times but I am doing something wrong. I am able to select the characters but the next slide is blank when initial state is hidden, if I change it to normal state it jumps to the next slide but only the female character is visible. Thanks. It finally worked! Yay! My variables were not set right. Hi Sabrina! I'm having the same problem... What was wrong with your variables ? Marie, under the Triggers on the first slide, I had variable =1 instead of value =1. I played around with it a lot and had better success after downloading Nicole's file and understanding how the triggers and variables were set in her example. Hope this helps. I am using Storyline 1, not Storyline 2. Is it possible to set this up with my version of Storyline? I tried to download the file as seeing helps me to figure it out, but I cannot view the file type. Hi, all! I have created the same type of "choose your character" course, using true/false variables. I was looking for info on how to mitigate the little lag with setting the state change at the start of the timeline - you can still see the change take place, even though it's fast. I changed the initial state to hidden as you did, but it didn't change the issue, and I see yours does it too...does this change in publishing, or any solution available? Thanks!! Hi Nicole, Is there any way to allow the characters to change expressions throughout the course? Thank you! Awesome, thanks so much for a great idea, Nicole! Can't wait to try this with our learners. Thanks for the comment, Angela, so glad you found the video helpful! I just used this technique to create a menu of 6 different avatars. It would've taken me forever to figure out how to do this. Thanks! Thanks for sharing - you explained it so well. I'm really going to give this a go. Great, thanks for sharing! I really would like to use this in my course and I have been watching your tutorial several times yet...when I create a new course - like you do in your tutorial, it works. But in the course I have already set up, it doesn't. I know it is really hard to help without seeing the course - but do you know if it is a problem that I have some slides between the "Select your character" and the slide where the character appears again. I've been sitting here for hours :/ but I can't find the mistake I made :( Thank you! I've run into this - the solution I came up with is to have a null state. Basically I insert a character as the 'default' character that appears before the variable changes to the selected character. I make that 'default' character's beginning state be Hidden. That way there's nothing to show up before the trigger fires to change to the selected character. Hope that makes sense. Hey Sean, thanks for responding! Toyed around and for some reason when I used a single character (default hidden) using a variable to dictate male/female, I was getting a lot of glitching. Have switched to using 2 separate characters and the issue seems to be resolved.